Google Maps now includes a cool new feature that lets you preview a route with a 3D bird's eye animation, whether you’re driving, walking, biking, or using mass transit. To use it, go to Google Maps, click "Get directions," and input your start and end points—just like you would normally. Starting Friday Google has added a small "3D" button next to "Driving directions to (your destination)." 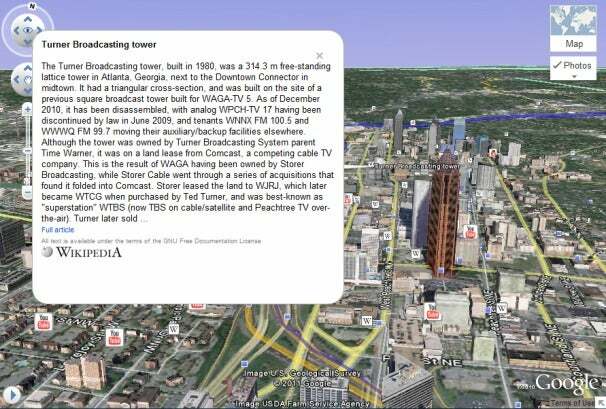 Click on it and your once two-dimensional route comes to life in Google’s Web-based version of Google Earth. 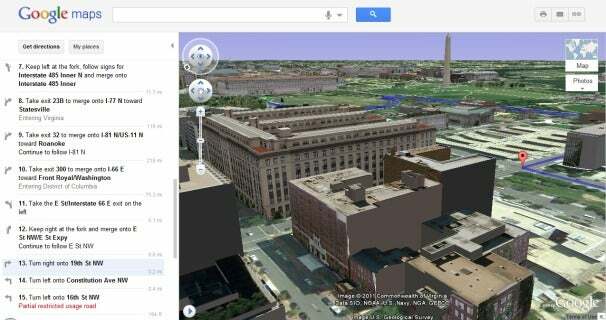 Now views allow you to see 3D rendering of elevations such as buildings, hills and mountains as Google flies you along your recommended route. You can pause the flight by clicking anywhere in the 3D view or on the pause button in the lower left of the map. While the flight is paused, you can explore the surrounding area in 3D by clicking and dragging the map. For instance, you could take a break from your helicopter ride and click on photos, YouTube videos or Wikipedia pages that are geo-linked to locations along your route. To resume the flight, you just click on the play button in the lower left of your map. If you’re not sure which leg of the trip you’re seeing, just look to the left panel where it is highlighted in the directions. You can also use this pane to fast forward or reverse your virtual trip by clicking on a different step. If the images here -- captured from a virtual trip from Atlanta to Washington, D.C. -- don’t impress you, check out the blog post from Google’s Earth and Maps team where they show photos from a picturesque drive from Carmel, California to Big Sur. Either that, or play around with it yourself -- maybe taking a pretend trip from London to Paris, or Beijing to Shanghai.